Cilia appear to be derived, evolutionarily, from structures present in the ancestral (pre-ciliary) eukaryote, such as microtubule-based vesicle trafficking and chromosome segregation systems. Experimental observations suggest that the ciliary gate, the molecular complex that mediates the selective molecular movement between cytoplasmic and ciliary compartments, shares features with nuclear pores. Our hypothesis is that this shared transport machinery is at least partially responsible for the observation that a number of ciliary and ciliogenesis-associated proteins are found within nuclei where they play roles in the regulation of gene expression, DNA repair, and nuclear import and export. Recognizing the potential for such nuclear roles is critical when considering the phenotypic effects that arise from the mutational modification of ciliary proteins. Cilia, whether immotile (primary) or motile, flagella (on sperm), or the cilia-based structures within photoreceptor cells, represent a distinct cytoplasmic and plasma membrane domain . As has been reviewed recently, mutations in cilia- or ciliogenesis-associated proteins can lead to a range of human pathologies, known collectively as ciliopathies [8, 26, 31, 49, 64, 76, 86, 88, 91, 94]. In addition to their well appreciated cilia- and ciliogenesis-associated roles, it is now increasingly apparent that cilia-associated proteins have non-ciliary, cytoplasmic roles, described in a number of recent reviews [87, 93, 102]. For example, it is well established that cilia and cilia-associated proteins are involved in Hedgehog, TGF-β, Wnt, PDGFRα, Notch, and Hippo inter-cellular signaling systems [12, 31, 36, 62, 65, 86]. That said, cilia themselves may not be strictly necessary for a number of these signaling pathways. For example, myeloid and lymphoid cells reportedly lack cilia (primary or motile) yet express cilia-associated proteins  and support Hedgehog signaling [16, 93]. Similarly, in the zebrafish, Huang and Schier  found that genetic abolition of maternal and zygotic cilia formation left Wnt signaling intact while dysregulating hedgehog signaling. In addition to their signaling functions, there is clear evidence for the role of a number of cilia-associated proteins in DNA damage repair [4, 102]. In this review, we highlight the observation that a number of cilia-associated proteins have a nuclear presence, and in some cases, functional nuclear roles. We consider the possibility that the nuclear functions of cilia-associated proteins, arising in part from their evolutionary ancestry, can contribute to ciliopathic phenotypes through both developmentally specific and more generic mechanisms. While speculating about processes that occurred billions of years ago can be problematic, there is a clear consensus that the evolution of cilia began in an ancestor that contained a nucleus, with nuclear pores mediating molecular movement across the nuclear envelope and microtubule-based systems involved in chromosome segregation [10, 27, 58, 59, 70]. Entry into the ciliary domain is regulated through a distinct “transition zone” between non-ciliary cytoplasmic and plasma membrane domains. The details of this ciliary gate are beginning to be resolved [17, 39]. Resendes et al. reported that the basal body protein centrin-2 (Cetn2) interacts with the nucleoporin (Nup) 107–160 complex, an integral component of the nuclear pore. As with the yeast homolog Cdc31 [25, 74], Cetn2 is an integral component of the nuclear pore. The observation that nuclear transport proteins and nuclear localization-like sequences are involved in ciliary transport [19, 38, 83] and that blocking nuclear transport also blocks ciliary import [43, 82] suggests that nuclear pore/transport proteins were co-opted during ciliary evolution. That said, Breslow et al. failed to find Nup localization or a functional role for Nups in the passive permeability barrier of primary (immotile) cilia. It is clear that that this ciliary permeability barrier/transport system, which we refer to as the ciliary gate, is structurally and functionally distinct from the nuclear pore complex. In their studies of various motile cilia in the developing Xenopus embryo and cultured human retina pigment epithelial (RPE) cells, del Viso et al. found evidence that the association of the inner ring (of the nuclear pore complex) Nups 188 and 93, but not other Nups examined (e.g., Nup63), are required for the formation of motile cilia in a range of cell types (the authors did not examine immotile, primary cilia). Their structural studies localized Nups 188/93 to the cilia base region, while 3D super-resolution microscopy in RPE cells revealed “the presence of two discrete structures, each composed of dozens of individual localization clusters that could not be resolved by confocal microscopy.” The overall distribution of cilia-associated Nup188/93 is distinctly different from the distribution of these proteins at the nuclear pore. In the light of these studies, there is a general possibility that a subset of cilia-associated proteins contain localization/interaction sequences that can be recognized by cilia-associated structures, such as the Nups found in the pericentriolar material (PCM) region of the ciliary base, as well as components of the nuclear pore complex. The association of RAN complex components, important in active transport through nuclear pores , in the transition zone of cilia supports this model [19, 21]. RAN appears to be involved in “controlling injections of IFT proteins into the flagellar compartment” and “is, therefore, crucial to ciliogenesis” . Similarly, transport of Kif17 [19, 29], retinitis pigmentosa 2 protein (RP2) , and Gli2  into cilia is reported to be importin-β2, but not importin-α/β1, dependent (in the case of Gli2). As examples, both the ciliary axoneme-associated radial spoke protein 3 (RSPH3–OMIM: 615876)  and the pericentriolar and ciliary basal body-associated protein pericentrin (PCNT: OMIM: 605925)  have been found to contain functional nuclear localization (NLS) and nuclear exclusion (NES) sequences. Similarly parafusin, a signaling scaffolding protein, has been found localized to the base of primary cilia in a variety of mammalian cell types and within the nuclei of fibroblasts . The question arises then how common is it to find cilia-associated proteins in nuclei and what roles, if any, do they play there? Eukaryotic cilia are complex organelles composed of modified (double and triplet) microtubules and various associated proteins. Ishikawa et al. identified 195 polypeptides in primary cilia, of which ~75% appeared to be present in motile cilia as well. Proximity labeling studies  have identified over 370 cilia-associated proteins. Boldt et al. used an affinity proteomic-based study to identify 1319 cilia-associated proteins, 4905 inter-polypeptide interactions, and 52 molecular complexes. Such interaction complexity highlights the heterogeneous nature of ciliary functions in specific cell types and the likelihood that multiple evolutionary events along the vertebrate lineage have led to multiple functions for many of these proteins. It is important to consider, however, that just because a protein is found associated with other ciliary components does not mean that its primary or sole function is ciliary. Many proteins are poorly studied, apparently for largely historical rather than functional criteria; Pandey et al. coined the term “ignorome” for such proteins (and the genes that encode them). A dramatic example of the difficulty in defining gene product functions (one basis for the ignorome) is illustrated by the studies of Hutchinson et al. who produced a minimal bacterial genome (JCV-syn3.0) containing 473 genes. Analysis of JCV-syn3.0 revealed an ignorome of 149 genes of unknown function (~32% of the total genome); these are genes required to produce a viable organism. At the same time, there is an increasing awareness that a number of proteins, originally identified as structural or functional components of one cellular system, can have quite distinct functions in another; they are what we might term “multi-taskers.” An example of such multitasking proteins is the catenins. Originally identified in the context of cadherin-based cell adhesion junctions , catenins were subsequently recognized to play important roles in the extracellular signaling-mediated regulation of gene expression [47, 54]. In this light, Kustatscher and Rappsilber  suggested that proteins have a certain degree of “fuzzy” distribution within cells. This notion, strengthened by proteomic analyses of subcellular compartments and organelle fractionation, indicates that stochastic intracellular movements are evolutionarily advantageous, as they increase the interaction potential of multitasker proteins. Contextually advantageous interactions are eventually “captured” by positive selection. This may well be the case for ciliary proteins in the nucleus, where their shared functions within related structures put them in position to acquire novel roles under specific circumstances. One approach to defining the extent to which cilia-associated proteins are localized to nuclei involves mass spectrometric–proteomic studies of isolated nuclei. There are often technical obstacles to overcome in such an analysis, including the possibility of protein leakage and redistribution during nuclear isolation (see ). In their study Wühr et al  exploited unique aspects of the Xenopus laevis oocyte nucleus (the germinal vesicle), specifically its large size (~400 μm in diameter) and the ability to isolate intact germinal vesicles rapidly from late stage oocytes (Fig. 1) . At the same time, oocytes are not known to express cilia of any kind, which limits the analysis to those proteins expressed during later stages of oogenesis. Wühr et al. 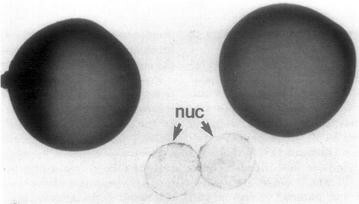 characterized proteins based on their “relative nuclear concentration” (RNC), defined as the ratio of concentrations in the nucleus to the concentrations in nucleus plus the cytoplasm“; the RNC ranges from 1 for a totally nuclear protein to 0 for a completely cytoplasmic (non-nuclear) protein. Of course polypeptides that reside in the nucleus are synthesized in the cytoplasm, nuclear isolation is not completely “clean” (even with isolated germinal vesicles), and a number of proteins are known to shuttle between nuclear and cytoplasmic compartments, so most RNC values are intermediate between 0 and 1. Nevertheless, it is possible to distinguish classes of proteins that appear to be excluded from nuclei and confined to the cytoplasm (value of RNC <0.1) from those that have a significant nuclear localization signal (RNC >0.35). To estimate the number of cilia-associated proteins localized to nuclei, we used the Wühr et al. dataset together with the “gold standard” set of ~300 cilia-associated polypeptides described by van Dam et al. 1; to this database, we added polypeptides known to be involved in ciliary function, i.e., C2orf59 , Cetn2 [81, 90, 101], and EFHC1 and EFHC2 (see ), for a total of 307 polypeptides. Of these 307 “gold standard” ciliary proteins, Wühr et al. report data on 118; of these, 30 (~25%) have RNC values of >0.35 (Table 1) and so are expected to have a significant nuclear presence. Other 29 polypeptides (~24%) have RNC values between 0.35 and 0.1 and may well be able to enter the nuclei. Within subgroups of related proteins, such as the interflagellar transport polypeptides (IFTs), most appear exclusively cytoplasmic, but a few (e.g., IFT27) (Table 1) seem to be present at significant levels within the germinal vesicle. Similarly, the radial spoke protein RSPH4A (OMIM: 612647) has an RNC value of 0.9, higher than the known transcription factor SOX13 (0.84), suggesting that RSPH4A is strongly concentrated in the germinal vesicle. In contrast, β-catenin (CTNNB1), which is well known to be able to enter the nuclei in response to canonical Wnt signaling (see ), appears to be exclusively cytoplasmic (RNC = 0.031) in the oocyte. IFT25, part of IFT-B complex. Forms a complex with IFT27. RNS = 0.30 (nuc + cyto). In a related set of unpublished studies, “nuclear” fractions were prepared from human SH-SY5Y neuroblastoma cells and analyzed by mass spectrometry (Additional file 1); of the 307 “gold standard” ciliary proteins, 93 were found within this nuclear (Table 2) fraction, including 15 that also had a “nuclear presence” in the Xenopus germinal vesicle dataset (Additional file 1). Together these data support the hypothesis that a significant percentage of the polypeptides linked to cilia formation, function, and phenotypic defects appear to be able to enter, and potentially play functional roles, in the nucleus. At this point, we describe a few of the best characterized of these nuclear functions. Nephronophthisis (NPH) is an autosomal recessive cystic kidney disease characterized by inflammation and scarring (fibrosis) that compromises kidney function and leads, over time, to end-stage renal disease . Many of the genes linked to NPH, encoding polypeptides known as nephrocystins or NPHPs, have been found to encode proteins localized to or involved in primary cilia formation or cilia-dependent signaling (both Wnt and Shh) which presumably explains phenotypic effects on other organ systems. Where other organs are involved, the disease is termed NPH-related ciliopathy . Of the NPHP-associated genes, a number have been found to have direct or indirect nuclear roles. For example, NPHP4 (nephrocystin-2: OMIM 607215) interacts with and inhibits the LATS1 kinase, leading to the nuclear accumulation of the transcriptional co-activators YAP and TAZ, two proteins involved in the HIPPO (hypoxia) signaling system . NPHP9 (also known as NEK8–OMIM 609799) has been found to interact with TAZ, leading to the nuclear localization of the NPHP9–TAXZ complex . TAZ is normally exported to the cytoplasm through interactions with 14-3-3 proteins; NPHP9 appears to compete with 14-3-3 proteins for TAZ binding. NPHP4 inhibits LATS1 phosphorylation of TAZ, which reduces its affinity for 14-3-3 proteins. NPHP4 also interacts with the ubiquitin ligase JADE1 (another ciliary and nuclear component), an interaction that appears to stabilize JADE1 and lead to its nuclear localization where it acts to destabilize β-catenin and inhibit canonical Wnt signaling . NPHP4 itself appears to be primarily perinuclear. The absence of NPHP4 activity leads to an increase in Wnt signaling and subsequent cyst formation in the kidney . Studies in the zebrafish support this mechanism . NPHP7 (OMIM: 611498) is a GLI-like zinc finger transcription factor involved in the regulation of mesenchymal–epithelial cell behavior, inhibiting the expression of genes such as Snail1 and Wnt4 . Mutations in NPHP7 have been associated with NPH-related ciliopathy . Morpholino-mediated downregulation of NPHP7 has been found to influence the formation of immotile motile cilia and a number of associated phenotypes, including cystic pronephros and ciliary motility in zebrafish [45, 71], presumably due to effects on gene expression. NPHP10 (OMIM: 613524) localizes to nuclear foci with a number of DNA damage response proteins, including the centrosomal protein CEP164 (OMIM: 614848) . OFD1 (OMIM: 311200) is one of an array of nine phenotypically similar disorders. OFD1 is an X-linked dominant disease associated with facial malformations as well as cystic kidneys . OFD1 has been linked to the gene OFD1 (previously known as Cxorf5) (OMIM: 300170). In a mouse model OFD1 has been associated with defects in primary cilia formation and left–right axis formation . Subsequent studies indicate that OFD1 has a nuclear presence, and plays a role in chromatin remodeling  and in double-stranded DNA break repair, mediated by the TIP60 complex . Bardet–Biedl syndromes are group of pleiotropic oligogenic ciliopathies  that have been linked to (at least) nineteen different genes with potentially etiological roles. Of these, BBS1, 2, 4, 5, 6, 7, 8, and 10 have been found to enter the nucleus where they can influence gene expression through interactions with the polycomb group member protein RNF2 (Ring Finger Protein 4: OMIM: 602850) . Both BBS1 (OMIM: 209901) and BBS11 (OMIM: 615988) have been reported to interact with and to alter the activity of NPHP7 [45, 71]. Centrins (Cetn) are calmodulin-like proteins associated with centrosomes (microtubule-organizing centers) and the basal body regions of cilia. Two centrin subclasses have been identified, Cetn2-like and Cetn3-like [14, 28]. In the yeast Saccharomyces cerevisiae, there is a single centrin gene (Cdc31); the Cdc31 protein is found localized to nuclear pores in addition to the spindle pole body . Mutations in Cdc31 lead to defects in mRNA export . In vertebrate cells, Cetn2 (OMIM: 300006) has been found associated with nucleoporins and localized to nuclear pores; expression of the Cetn2-binding regions of NUP160 led to a decrease in nuclear export of mRNA and proteins, without obvious effects on protein import . While Cetns have been reported to play a role in cell division in vertebrate cells , subsequent studies in chick DT40 cells  revealed that null mutations in all three centrin genes had no effect on cell division (although effects on cilia formation were not reported). This made it possible to examine the nuclear functions of centrins, two of which had been previously reported. First, Cetn2 is an integral component of the nucleotide excision repair/xeroderma pigmentosum group C (XPC–RAD23–CETN2) complex [3, 63]. Cetn2-null DT40 cells displayed no defects in centrosome formation or cell division but were reported to be hypersensitive to UV irradiation . The nuclear excision repair protein Rad33 appears functionally homologous to Cetn2 . The centrin-associated protein pericentrin (PCNT) (OMIM: 605925) has also been implicated in DNA damage repair . Interactions between pericentrin and microcephalin (MCPH1) have been implicated in primordial dwarfism , genome instability, and centrosome amplification . More recently, Cetn2 has been found to be part of the nuclear pore-associated TREX-2 complex (GANP, DSS1, ENY2, PCID2, & CETN2) . TREX-2, in turn, has been reported to interact with the Mediator complex, linking the regulation of gene expression and the export of mRNAs from the nucleus [78, 79]. Our own work in Xenopus indicates that Cetn2 associates with sites within the promoter regions of a subset of FGF and FGF receptor genes, regulating their expression and that its morpholino-mediated downregulation leads to defects in mesoderm formation . An interesting point to emerge from studies of Cetn2 is that while standard immunofluorescence microscopy reveals it to be concentrated at centrosomes and basal bodies, cell fractionation studies suggest that more than 90% of centrin is soluble  and associated with the xeroderma pigmentous complex (XPC) nucleotide excision repair complex [3, 63], a reminder that proteins can redistribute, often dramatically, upon cell solubilization (see ). Chibby (Cby1) (OMIM: 607757) is a small evolutionarily conserved protein associated with basal bodies and involved in ciliogenesis . In humans, there are three Cby-like proteins (Cby, Cby2, and Cby3). In vertebrate cells but not (apparently) in Drosophila , Cby acts as a negative regulator of β-catenin-mediated Wnt signaling [80, 84, 85].2 Cby’s interaction with β-catenin involves 14-3-3 proteins and leads to β-catenin’s export from the nucleus [44, 50]. STRING analysis (Fig. 2) indicates that Cby1 interacts with a number of 14-3-3 (YWHAX) proteins; a conclusion supported by preliminary studies in which Cby-GFP was found to co-precipitate with a number of YWHAX proteins in Xenopus (stars in Fig. 2) (McClure-Begley et al. unpublished observations). In human-induced pluripotent stem cell (HiPSC)-derived cerebral organoids, Cby is widely expressed and appears largely nuclear (McClure-Begley et al. in progress) (Fig. 3). Characterization of cby −/− mice (in a C57BL/6 background) showed that ~75% died within 2 weeks of birth and were “runted and demonstrated anemia” ; those animals that survived displayed a number of cilia-related defects . In X. laevis, morpholino-mediated downregulation of Cby led to ciliary defects and abnormal neural crest, central nervous system, and pronephros development . Many, but not all, morphant phenotypes could be ameliorated by the extracellular Wnt inhibitor SFRP2, suggesting that these Cby deficit phenotypes are due to increased Wnt signaling. In this light, Cby morphant effects on Hh components were not rescued by SFRP2, and so presumably represent other (that is, non-canonical Wnt signaling related) processes . A similar behavior appears to be displayed by the 92 kDa nuclear form of Inversin (OMIM: 243305), which has been found associated with β-catenin . Whether, like other β-catenin-interacting proteins [54, 97], Cby1 and Inversin also interact with the paralogous protein plakoglobin (ɣ-catenin or JUP: OMIM: 173325) has not been reported. The challenges in separating the ciliary and cytoplasmic from possible nuclear functions of cilia-associated proteins are similar to those faced in the analysis of the adhesive (cytoplasmic) and gene expression (nuclear) roles of β-catenin and γ-catenin (plakoglobin), which share many interaction partners . The use of cytoplasmically anchored forms allowed us to conclude that γ-catenin’s effects on β-catenin-mediated gene expression were indirect . Given the shared mechanisms acting at nuclear pores and ciliary gates, a similar (or perhaps a more modern) strategy seems necessary to distinguish the ciliary and cytoplasmic from the non-ciliary, i.e., nuclear, functional roles of cilia-associated proteins. Based on a simple BLAST search, there does not appear to a Caenorhabditis elegans ortholog of Chibby. The manuscript was conceived and written collaboratively by the two authors. Both authors read and approved the final manuscript. We thank William Old, Chris C. Ebmeier, Douglas A. Chapnick, and Kerri E. Ball for sharing their data on the proteomic analysis of nuclear fractions of SH-SY5Y neuroblastoma cells (Additional file 1). We thank Jianli Shi, Ying Zhao, and Mark Winey for support and discussion over the past few years. Results from the proteomic analysis of SH-SY5Y cells will be made publicly available through the Old Lab web server. Previous work on cilia in Xenopus was supported in part by a supplement to NIH Grant GM074746. Proteomic analysis of SH-SY5Y cells was carried out under a cooperative agreement with DARPA (13-34-RTA-FP-007) to William Old. Studies on human iPSC-derived organoids have been supported by grants from the Linda Crnic Foundation to Tristan McClure-Begley, William Old, and Michael Klymkowsky. 13630_2017_52_MOESM1_ESM.pdf Additional file 1. Additional material.